While we wait for the kalboishakhi to tear up the skies, we bring to you a glimpse of all the pitter-patter. Seen through the lens of Munem Wasif, this photo feature is simply our way of reminiscing about rain. Rain falls and all else is blotted out. Angry, sad, or simply ready to burst, the kalboishakhi wraps us in a whirlwind of rustling leaves, dust and memories of a childhood collecting mangoes and smelling the wetness of the soil. Writers, painters, farmers and lovers wait for it all year round, impatiently eyeing the skies for the first signs of grey. Cola, detergent, insurance and all other ads suddenly have a dash of monsoon in them, showing children, couples, old people, farmers and shopkeepers singing and dancing in the rain. Dhaka roads swell up, vomiting the underbellies of the inefficient drainage system submerging cars as they travel back and forth through them, in no way dampening the festive mood of the children using tree branches as diving boards and jumping into puddle pools and making paper boats and racing them in the smelly waters. 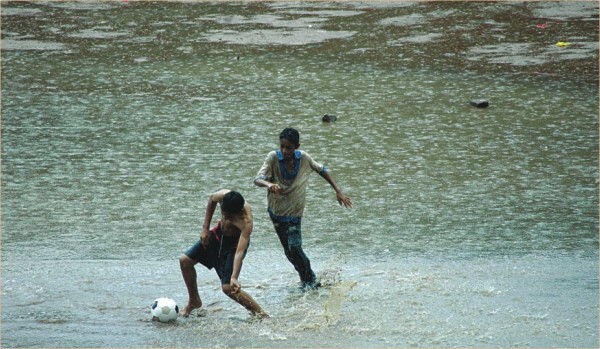 That's the magic of a Dhaka monsoon- it takes and takes from you and also gives so much. It washes away whole dwellings in slums, displacing large numbers of people but also entertains housewives on rooftops bathing in the torrents as they fall. It washes clean the fresh leaves filling the world with hope and possibility and at the same time cruelly drenches the poor young graduate in his best suit, walking to the interview of his life. But in the end it just leaves you happy that it happened.